Let Miru use all her attacks twice (Hell or above). Wall jump without wall jump item! Got hit 2 hits or less and defeat Lv 50+ ??? Game over when there are Otaku beside Erina. Finish true boss rush with Syaro. (with DLC) -or- obtain 120 achievements (without DLC). Play a round of Boss Rush. Rumi will be sad if she know this! Skip to Chapter 9 by finding a secret room! 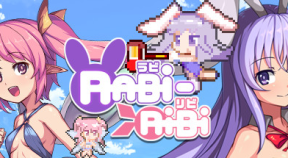 Place 5 votes in Rabi Rabi Island Voting Contest. Deal a huge single hit during one of the boss battle! OR defeat one of the SP Boss. Achieve a long distance in long jump minigame. Achieve S Rank or above in SP Irisu, SP Rita, SP Syaro and SP Miru. Thanks for playing! Cocoa's So Happy, That She've Found You. Try Sound Test Mode and play that music. Discovered 50% of Items and Maps. Don't let her debuff you! Got a game over from an Instant Death debuff. Obtain the first 14 CG. Then view them in gallery. Collect 50+30 Easter Eggs. More than 50!